As you’ve heard from reading my emails and following youchamp on social media (if you haven’t, you’re really missing out), we’ve been working on youchamp to make sharing with your friends even easier. Check out the new youchamp expense management features – share costs any way you like, with as many people as you like. And you can keep sharing memories, words and expenses after everything has been paid. We know you hate logging into your bank app and manually entering bank account details. So we found a solution! Pay and get paid directly in youchamp with the simple press of a button. Also! 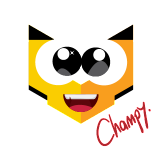 Champy has gotten a lot chattier. Ask me all your sharing-related questions in youchamp and I’ll try my best to help! Seriously, you need to update your youchamp app QUICK so you can share memorable moments without the icky bits. The best things in life are shared. Download youchamp now and make every moment a special one.